The process of the NRC identifying 'foreigners' is by no means a simple bureaucratic exercise. It is a bitterly fought and contested, political issue with a history that spans decades. Years ago, when I finished reading Sanjib Baruah’s book, India Against Itself: Assam and the Politics of Nationality, I had said that I expected his next book to be titled Assam Against Itself. Since that book never appeared, I am using my own imagined title for this piece. I am a second-generation refugee from Assam. My paternal roots are in Mymensingh. My father, after a brief stint as a clerk in IIT Kharagpur, had joined the Northeast Frontier Railway as a stenographer in 1951. I was born to Bengali Hindu parents in Assam. I am an Indian citizen. But it will be accurate to designate myself a refugee-citizen, to emphasise the detail of my hyphenated identity, being tied to Partition. 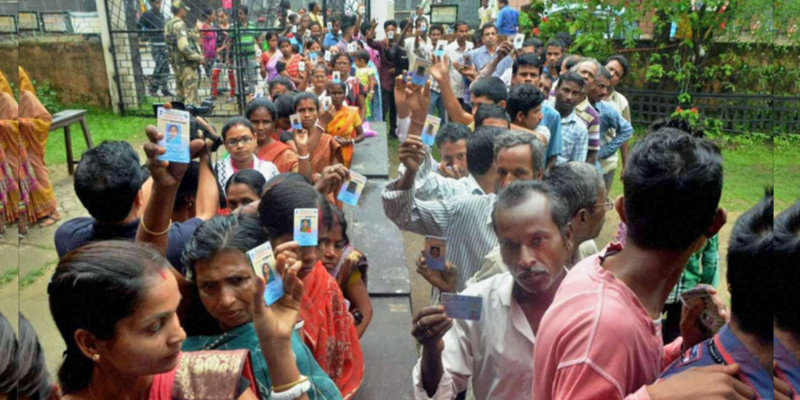 This identity – more acutely for the Bengali Muslim refugee-citizen – is today once again under severe pressure to prove its legal credentials in Assam. I do not have any personal ties with Assam today, except for a few cousins and friends who continue to live there. But I am concerned about the fate of every refugee-citizen. They are my only political kin. Our suffering has a similar ring, though I am much privileged in comparison. 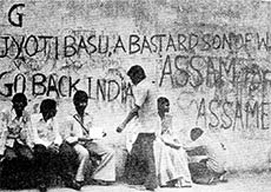 I witnessed the peculiar face and language of the Anti-Foreigners Movement in Assam as a schoolboy between 1979 and 1984. I learnt the meaning of “curfew” and “bohiragata” (foreigner, in Assamese), on a cold day in December 1979. It was the first day of many curfews. We were escorted home from the makeshift central government school by the ghat of the Brahmaputra by an official car. The scenes of that day are still vivid. I remember the grim air, ripe with a strange fear. As we were taken through the streets, I noticed all the shops were shut. Shops would shut every Thursday, but never were the streets so deserted. And never were the streets so full of gun-wielding policemen. Even the doors and windows of houses in ‘Sudden Colony’ (named after a locality suddenly sprang up from an abandoned railway yard), were shut, as if following someone’s decree. A friend had whispered to me in the classroom, “The Assamese are at war with the Bengalis.” I was bewildered. I had heard of no such war in these years. Things were fine even that very morning when I left for school. What caused a war within these few hours? I thought the boy had heard some dreadful rumour. I was pursued by a strange fear, because I did not know the reasons behind that fear. As I reached home, my relieved parents rushed to hug me. They were shaking with worry. What I had thought was a rumour, was on everyone’s lips in the neighbourhood. I was gripped by the faceless animal of fear. I trembled without knowing why I was trembling. I saw black smoke bellowing out of what we recognised as ‘Petrol Pump’, a place few kilometres away. News of stone throwing at Bengali homes was pouring in. The realisation quickly dawned upon me, that home, school, street and neighbourhood, were no longer safe places. Fear changes the configuration of the world. It occupies your breath and eyesight. Fear was the defining feeling of my entry into history. I learnt I was an outsider in my own birthplace. A status I earned from the Assamese Hindus, who claimed to be the sole natives of Assam. My schizophrenia vis-à-vis my homeland was born. On July 30, 2018, the Indian government released an updated draft of the National Register of Citizens for the state of Assam. It is meant to classify the legality of citizens living in Assam, on or before March 24, 1971. Four million people found their names omitted from the register, their status turning illegal overnight. As news of people who claimed their names were wrongly missing from the register trickled in, a flurry of debates appeared. The majority community of Assam – the Assamese Hindus – who spearheaded the Anti-Foreigners Movement in 1979, has largely defended the NRC against its critics. The liberal section among them broadly forwarded two sets of arguments in its favour: one, that even though the NRC may contain loopholes, it is procedurally sensitive to wrong omissions. Therefore it may be trusted rather than challenged. Two, the NRC was not, as was being made out to be, designed to target any particular community, language or religion. Its sole interest was to help the state husk the legitimate citizens from the illegitimate ones. This would enable the state to unburden the demographic imbalance in Assam and pave the way for peace and prosperity of the region. The point was also made about the necessity to safeguard the lives of Assam’s ‘indigenous people’, whose cultural environment was under threat due to the unchecked influx of refugees from Bangladesh. These refugees then created unwelcome imbalances in the livelihood of citizens, causing socio-political unrest and a perpetual sense of threat. Before I address these biased concerns, I want to add that all those who made the above arguments either refrained from making any critical remark on the Assam Movement, or upheld its cause. Such tacit or overt display of political fidelity, fuelled by a willing ethnic complicity to an inherently communal movement, puts the efforts made by Assamese Hindus to put forth objective and ethical concerns in favour of NRC under grave doubt. The concerns of the Assam Movement were clearly majoritarian. Its language was unabashedly crude. In the torchlight processions that passed by our lanes during the days of the anti-foreigner stir (as we were forced to observe ‘blackout’ or risk our windowpanes being stoned), the Assamese battle cries of ‘Foreigners get out’, ‘Drive out foreigners’, would include a slogan of racial and communal profiling: ‘Ali, coolie, Bongali (Bengali) / Naak sepeta (blunt-nosed) Nepali’. Ali was for Muslims, coolie, for Bihari labourers, the word ‘Bongali’ carried a tone of abuse for the community, and Nepalis who came for livelihood from North Bengal, were also seen as encroachers. The slogan proves Assamese sentiments were not restricted to being anti-Bengali. All migrant communities were resented, even though they contributed to the economy. The diverse range of migrants bore the brunt of Assamese xenophobia. The problem with Bengalis goes back to colonial times. The British had imposed Bengali as the official language in colonially administered Assam between 1836 and 1873. 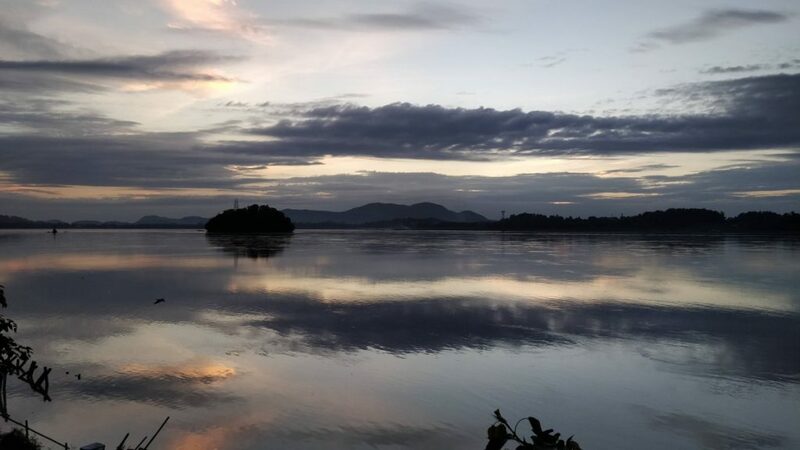 It included the Bengali-majority areas of three districts (Cachar, Hailakandi and Karimganj) in the Barak Valley region. The map of Assam was treacherously drawn by the colonialists, where many languages and communities (ethnic and indigenous) overlapped. The railways also occasioned a mobility of workforce from other parts of India. With the advantage of an English education, Bengalis monopolised clerical jobs in the railways. On October 24, 1961, Assamese became the only official language of the state. It propelled the ‘Bhasha Andolan’, or ‘campaign for language’, by Sylhet-speaking Bengalis in Barak Valley, who protested the imposition of Assamese. History was playing old games in reverse. Bengali protestors were fired upon by the state police and 11 people lost their lives. The Assam government relented and Bengali was granted official status in Barak Valley. Ethnic violence against Bengali Hindus goes back to the 1950s and 60s. It took a stringent turn in 1979. The Assamese Hindus were not keen towards sharing official status with Bengali, a language they considered a symbol of cultural hegemony. During the colonial period, the Assamese, aided by American Baptist Missionaries, had to prove the distinct linguistic status of their mother tongue vis-à-vis Bengali, to regain their eventual official status. There was a competition for recognition, and it took political turns. The cultural chauvinism of Bengalis in matters of language (and literature), and their hegemony in government jobs, did not endear them to the native Assamese. All these factors contributed to the vengeful passions ignited during the Anti-Foreigners stir of 1979. What appears to be clear from the story so far, as I play it back and forth, is that the Assamese people, facing the cruel vagaries of a colonially demarcated region torn by multilingual and multiethnic identities, reacted in the most extreme fashion. A twin battle, on both political and legal lines, was waged against Hindu and Muslim minorities who spoke Bengali. They were termed “foreigners”. The Assam Movement initially demanded 1951 as the cutoff mark to identify illegal citizens. But the Indian government insisted on 1971. The Assamese leaders acceded to the proposal in 1984, during the Assam Accord with the Rajiv Gandhi government. Today, the issue has returned to haunt minorities as the NRC has created a statistical scandal of identification as many citizens who have enough papers to prove their legality have found their names missing in the register. There are foreigner tribunals for people whose nationality is in doubt. There are detention camps for people whose names haven’t appeared on the NRC. An uncomfortably large number of people may soon be declared stateless. The official process of identification has been held far from satisfactory. The workforce mainly comprises people belonging to the majority Assamese community, and its neutrality is under question. After all, it concerns the future of millions of lives. The process of identifying “foreigners” is by no means a simple bureaucratic exercise. It is a bitterly fought and contested, political issue. It is strange to read Sanjib Baruah give credit (‘The missing 4,007,707‘, Indian Express, August 2, 2018), to the All Assam Students Union (AASU) and the Asom Gana Parishad (AGP) for bringing about the NRC. It is to grant legitimacy to extremely unethical political formations. The Movement had unleashed (and inspired) the crudest xenophobic movement in modern, Indian history. Baruah should get to hear some stories from Bengali Hindus and Muslims. The murder of a young Bengali doctoral student, who, after he getting off his medical college bus in Maligaon Chariali in Guwahati, was greeted by around 40 boys waiting for him with hockey sticks. My young neighbour, who was about to join the Indian Air Force, was knifed in the street by his childhood Assamese friend. The friend was helped by his mother, who was a nurse. The four young men who tried to abduct my elder sister as she was returning home from tuition. She saved her life with a nib pen. The next day at the police station, she identified the boys as students belonging to Guwahati University. The minorities whose names haven’t appeared in the NRC, despite the assurance that they can challenge their currently assigned status, are in a state of panic and nightmarish difficulty. I remember the endless nights of fear of a “surprise attack”. Our hunchbacked, old help from Dhaka would collect some iron grills just in case. I remember, during one of the torchlight processions, as a “blackout” was enforced, a young man broke out of the march and knocked on the door of a Bengali neighbour. The wife came out. The man asked for a glass of water. The woman fainted. Such was the palpable state of fear. These are stray incidents from a memory cupboard full of skeletons. I remember neighbours shivering from the cold, glued together to the Philips transistor, listening to the Bengali news service of the BBC and Voice of America. AIR hardly aired what was happening in Assam. We were learning about ourselves from foreign radio stations. This, more than anything else, made us feel like foreigners – that we were living in another country. Do refugees deserve the fear they inhabit? The Assam Movement can be granted moral legitimacy only if we agree that refugees are other people. In the same article, Baruah writes, “The judicialisation of matters that are ultimately political is always a mixed blessing.” I disagree. It is, at best, a mixed curse. But in no uncertain terms, it is a matter of dubious means. The judicialisation of the political is to simply shift the arena of prejudice. A political movement based on chauvinism and hate deflects its strategic energies into the legal realm, seeking to create an authentic discourse of delegitimising “illegal populations”. Such a move turns the legal into the political. What Baruah calls judicialisation of the political, is actually the opposite: It is the politicisation of the judicial. The minorities whose names haven’t appeared in the NRC, despite the assurance that they can challenge their currently assigned status, are in a state of panic and nightmarish difficulty. There is literally – and legally – no ground beneath their feet. It is true, the “liminal legality” Baruah speaks of, does pose a challenge for democracy. Isn’t it primarily, the ethical responsibility of Assam’s majority community? 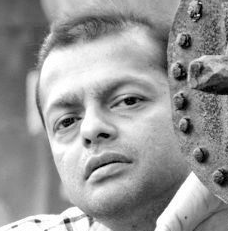 Baruah raised more interesting questions in his earlier article, (Stateless in Assam, Indian Express, January 19, 2018), where he quotes Hannah Arendt to define the state of stateless people, caught between the concentration camps offered by their foes and detention camps offered by their friends. The exclamation attributed to Aristotle by Montaigne, “O my friends, there is no friend”, seems to be the current plight of the Bengali refugees in Assam. It reminds me of Bhupen Hazarika’s song, ‘O Bidekhi Bondhu’ from Chameli Memsahib (1975), which is perhaps the only instance in Assamese popular culture, where the foreigner is spoken of in endearing terms. “You are entrapped in a cyclone/lost your anchor” goes the song, which comes eerily close to the plight of those facing the mess of the NRC. One of the great cultural figures of postcolonial Assam, Bhupen Hazarika was a man of two cities, two languages and two sensibilities. He belonged to Assam as much as he belonged to Bengal. Did anyone accuse him, the way someone had accused me, holding me roughly by the collar in the middle of the street, of having my heart in Calcutta? Why can’t our hearts belong to more than one place? Why can’t we, unlike trees, have parts of our roots – elsewhere? I want to however reiterate here, that the worst sufferers of the Assam crisis are the Bengali Muslims. There is no equivalence among the many victims of the political calamity unfolding in Assam. The Nellie massacre in February 18, 1983, where Bengali Muslims living in fourteen villages faced the rawest violence yet unleashed by the Assam Movement, confirmed the most vulnerable “foreigners” in the state. Subasri Krishnan’s documentary, What the Fields Remember (2015), made 30 years after the event, recounted the violence through the voices of two old, Muslim men. Their stories are unbearable. What is equally disheartening – and illuminating – is that they have waited in vain for justice. How can people dubbed foreigners, and whose families have been massacred with impunity, expect a hostile place and people to render them justice? What is true of the Nellie survivors, is a logical fear that can be extended to all those who are facing the trial of citizenship by the NRC. The privileged Bengali Hindus of Assam, whether their names find place in the NRC or not, will not also speak for the Muslims, the way they did not speak for them in 1983. The cruel irony of history makes existentially enjoined sufferers remain separated by the religious narrative of Partition. Many Bengali Hindus are selfish refugees, incapable of forging larger solidarities because of communal considerations. It diminishes them, ethically, as people. Today, the Bengali Muslim most heavily bears the tag, “Bangladeshi”. The government at the centre is more interested in rehabilitating Hindu refugees. But to simply blame the BJP for being partial is not enough. The impartial communalism of the majority in Assam, eager to drive both Muslims and Hindus away by erecting a legal quagmire, is the primary problem. The bottom line on NRC is not implementation. It is the sniffer-dog idea of the state, hunting down “foreigners”. A democracy has to determine the costs of a method, legal or political, before unleashing it on people. It is not simply a question of human rights, but of human costs. To throw people into detention centres and camps will perpetually turn them into stateless animals, stripped of enough protection by the state.